Moroccan Lamb, Salmon, Stuffed Turkey Rolls, are some of the main courses this week. Turkey is a rather bland meat, lending itself very well to be stuffed with bright flavors. 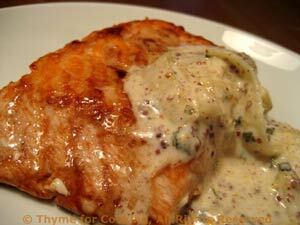 If you can't get thin turkey cutlets, you could use veal cutlets or chicken breasts, pounded thin. Lay turkey cutlets flat, pounding to thin or even out if needed. Lay pimiento strips on Prosciutto, spreading evenly. Crumble feta cheese and sprinkle on pimientos. Starting from one narrow end, roll up and tie securely with kitchen string. Add rolls and brown well on all sides. 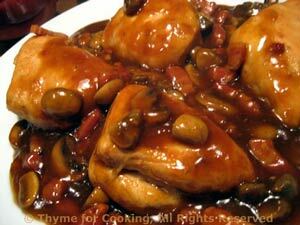 Add wine, stock, cover and simmer for 20 minutes. 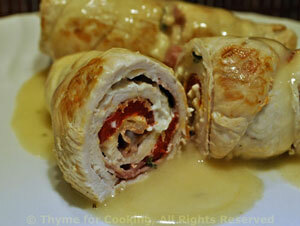 Remove string from rolls, cut each in half (looks nicer), spoon a bit of sauce over and serve. This is started hot, to brown the crust, then finished slowly. It remains a lovely rose when sliced... and the crust is fantastic.... The best lamb I've had. This will easily serve 4 - 6. Add more potatoes. Get a larger leg (and more potatoes) to serve more. 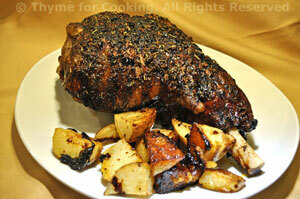 To serve: Remove lamb and allow to rest for 10 - 15 minutes before carving. Originally made with leftover lamb, this could as easily be made with fresh ingredients. The cherry tomatoes and green garlic add a touch of spring, and just enough 'tomato' flavor. The feta and dry-cured olives add the taste of Greece. Cut the lamb into bit-size pieces. Trim and thickly slice green garlic. Heat the oil in a large nonstick skillet. Add the carrot, celery, (lamb if it's raw) and sauté until tender, about 5 minutes. Add the green garlic and sauté 3 minutes longer. Add the cooked lamb, stock, beans, herbs and bring to a simmer. 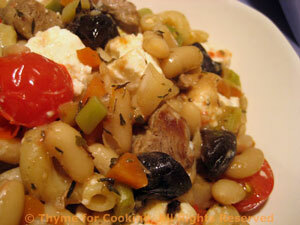 Add pasta, tomatoes, olives and feta, heat through. Fresh snow peas and cherry tomatoes are great for stir-fries: they cook quickly, add lots of color and get us out of traditional winter fare. Trim and slice green garlic or mince garlic. Trim snow peas and cut in half. In large nonstick skillet heat oil over medium-high heat. Add onion, carrot, celery and stir-fry 5 minutes. Add mushrooms, green garlic or garlic, mangetout and stir-fry 3 minutes longer. Add beef to skillet and sauté, breaking it up as it browns. 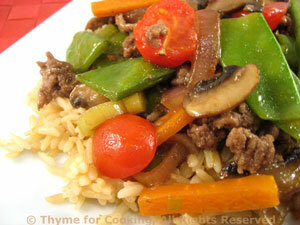 When beef is browned, return vegetables to skillet and add stock, sherry, cumin, soy sauce. Turn the heat up under the skillet and add the cornstarch mixture, stirring constantly until thickened. Add cherry tomatoes, heat through.